Wednesday began with a great deal of optimism for the St. Louis Cardinals. 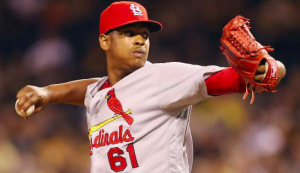 The team’s top prospect Alex Reyes made his long-awaited return from Tommy John surgery. Reyes started off well, tossing four scoreless innings against the Milwaukee Brewers. However, the club’s optimism over Reyes’ return was soon taken with a grain of salt after the youngster left the outing after four innings amidst concern for his health in a game the Cardinals ultimately lost 3-2. Things appeared to be going smoothly for Reyes until a sudden drop in his velocity in the fourth inning. He also started to struggle with his control. Cardinals manager Mike Matheny and pitching coach Mike Maddux were summoned to the mound along with the team’s trainer. Reyes was allowed to finish the inning but was immediately taken out as a precaution. The 23-year old Reyes didn’t have an explanation for the sudden drop in velocity. He ended up throwing 73 pitches, allowing three hits and two walks while striking out two and keeping the Brewers off the scoreboard through four innings. The team is unsure if he’ll see a doctor to explore a medical reason for the drop in velocity. The return of Reyes is potentially huge for the Cardinals. The St. Louis pitching staff has struggled with injuries all season. Ace Carlos Martinez and veteran Adam Wainwright are currently on the DL. Martinez is nearing a minor league rehab start but Wainwright’s season is in jeopardy. The St. Louis bullpen is also missing key pieces due to injury, most notably Luke Gregerson and Greg Holland. Over the winter, there was speculation that Reyes could be used out of the bullpen to curb his innings upon his return from Tommy John. At least until Martinez returns, the Cardinals need Reyes to fill out their rotation. However, a move to the bullpen could make sense later in the season if his innings count rises too high. Either way, Reyes has the potential to be an impact performer for the Cardinals the rest of the season. When he first came up in 2016, Reyes was 4-1 with a 1.57 ERA. He did that in five starts and seven relief appearances, so he’s capable of pitching in either role. More importantly, he’s capable of being a difference maker in either role. Obviously, his early exit from Wednesday’s game puts a damper on his return to the majors following a 15-month absence. But the Cardinals will still be excited to have him back in the mix. Amidst their injuries, St. Louis has lost ground in the NL Central race over the past couple of weeks. However, the Cardinals remain very much in postseason contention. With Reyes back and Martinez on his way, the Cardinals should be optimistic that better days are ahead. Sign up now to have a free consultation and see how Jon Price and his team can turn sports into a lucrative investment for you! NBA Playoffs: Do Any of the 0-2 Teams Have A Shot?